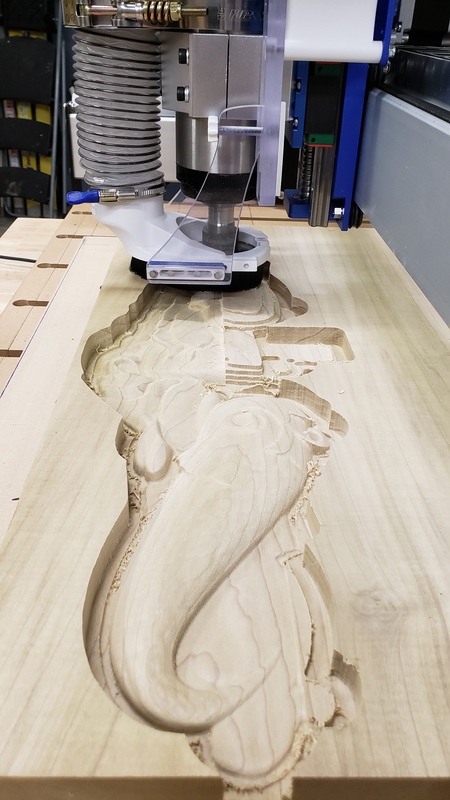 In fact I do not have a Shapeoko3, but instead an X-Carve, which I bought back at the end of 2016, before they changed it to have a single square gantry rail and I kick myself constantly because the flex is way out of control! It does however run using the same sort of Arduino+GRBL setup and so naturally PixelCNC has a GRBL/Mach3 post. There is a post-processor system and a few other posts that I haven’t personally tested but I tailored them specifically to the specs for the controllers that users reported needing support for. The current free trial limits input image size to a total area of ~65k pixels but I will be releasing v1.30a today which removes that restriction and instead imposes a 10 minute session time and a limit on the number of tool motions per operation in exported G-code. This lets users test out PixelCNC’s ability to handle higher resolution images properly. If this 69 year old geezer can do it, you can too! V Carve is great for 2D and allows you to import 3D projects for cutting. I use it all the time. You’ll love it. I’ve been looking at PixelCNC. And for the price it’s probably a good deal. I do have V-carve pro now. And cutting my very first 3D project. I’m still in flux about Aspire vs Fusion 360. After gettin started with Carbide Create I went with Vcarve desktop. I tried Fusion 360 but found that the learning curve was a little steep for me. Plus I was really impatient and wanted to get cutting. There are a lot of videos to help, but I wanted to cut stuff and Vcarve got me there quicker, and was easier for me to understand and learn. I then upgraded to Vcarve Pro, and just upgraded (last week) to Aspire. As others have said, if you but Vcarve, desktop or pro, you only pay the difference for the upgrade. With Vcarve Pro you can open and cut a single 3D file, but you are limited in editing them. Also you can’t make a 3D file. With aspire you can edit, or make 3D. Like taking a photo and converting it to 2.5d for carving. Though to be honest Im still figuring out all the new toys. As I said I just upgraded, so still learning. If you are willing to take the time, Fusion 360 is really awesome software that can open a lot of different options. For me personally Vetric is easier, and does what I want. Granted it is a very steep price for that convenience. Which is why I’ve done the upgrade path. I would say give the trial versions a go first.